Adoption of the document comes as there is new evidence of the country's disagreement over the austerity policy led by Europe's strongest economy, Germany. 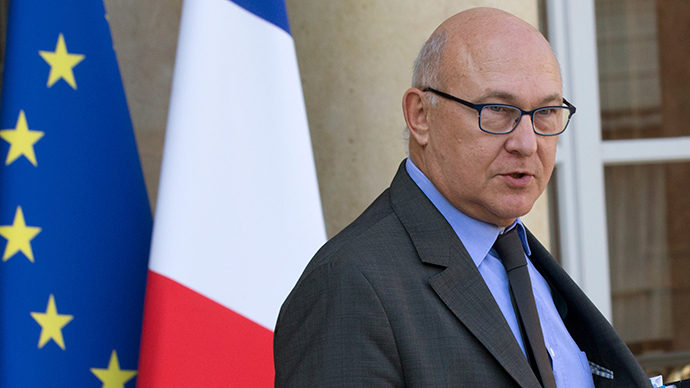 Paris has taken the decision “to adapt the pace of deficit reduction to the economic situation of the country,” Finance Minister Michel Sapin told reporters on Wednesday. “Our economic policy is not changing, but the deficit will be reduced more slowly than planned due to economic circumstances – very weak growth and very weak inflation,” he said. Under the new budget plan, the public deficit is set to fall from 4.4 percent of output this year to 4.3 percent next year, 3.8 percent in 2016 and 2.8 percent in 2017. The new budget plan still runs counter to earlier promises by Paris to lower the deficit to less than 3 percent by the second deadline set for next year. The first deadline was previously set for 2013, but extended. “No further effort will be demanded of the French, because the government – while taking the fiscal responsibility needed to put the country on the right track – rejects austerity,” the budget statement made by Paris read. However, Paris has committed to government cuts of public spending 21 billion euro by next year and 50 billion euro by 2017 on Wednesday. Still, Sapin said that France will not further extend the cuts as it would badly hit the economy. While Merkel did not particularly point at Paris, Germany’s main exporters’ association, the BGA, accused France of putting the European economy at risk. “If that country doesn’t figure a way out of the downward spiral, the euro and therefore Europe are at risk,” BGA president Anton Boerner said, according to his statement cited by Reuters. In August, Hollande asked French Prime Minister Manuel Valls’ to form a new government following tensions within his cabinet over the country’s economic policy. The decision came after strong criticism of the country’s economic direction which, according to former Economics Minister Arnaud Montebourg, has hindered France’s development. “My responsibility as economy minister is to tell the truth, and observe...that not only are these austerity policies not working but they are also unfair,” Montebourg said in a statement at a media conference on August 25. Germany’s attempts to resurrect the EU’s economy after the 2008 financial crisis have been marked by cutbacks and taxation. The austerity plan has proven to be severely unpopular in the eurozone, still struggling with economic weakness.